Yen’s rally accelerates in US session as helped by steep decline in stocks. Lackluster earnings is a factor weighing on sentiments. The lack of positive news from China-US trade talk is another. US Treasury Secretary Steven Mnuchin is in Beijing for two days of meeting. It’s common practice, a norm, as courtesy or whatever, for both sides to come out to say something nice after the first day of meeting. But so far, there is none. That could make traders a bit nervous. DOW is trading down around -1% at the time of writing. And that is not unexpected. We’ve mentioned in a quick comment earlier today that price actions from 23360.29 are a triangle pattern. It may or may not extend. But an eventual downside break out is expected to 38.2% retracement of 15450.56 to 26616.71 at 23351.24. Whether there will be another up-leg before the breakout could depend on tomorrow’s non-farm payroll. Back to the currency markets, we’d like to emphasized that EUR/USD is held below 1.2031 minor resistance, AUD/USD well below 0.7583, USD/CHF well above 0.9919. And even USD/CAD (CAD has been a rather resilient one) is in tight range below 1.2915. GBP/USD even extended recent decline to as low as 1.3537. The sharp fall in USD/JPY is not the end of the trend for Dollar. Instead, it just reflects that market are a bit nervous for now. And Yen also rides on the pull back in treasury yields. So Dollar bulls don’t need to panic before NFP. UK PMI services dropped to 52.2 in October, down from 53.9 and missed expectation of 53.4. “The disappointing service sector numbers bring mounting evidence that Brexit worries are taking an increasing toll on the economy. Combined with the manufacturing and construction surveys, the October services PMI points to the economy growing at a quarterly rate of just 0.2%, setting the scene for GDP growth to weaken sharply in the fourth quarter. “However, while it is not surprising to see that Brexit uncertainties are increasingly undermining business activity at this stage of the negotiations, the survey responses also suggest that the economy is facing other headwinds, including a broader global slowdown, trade wars, heightened geopolitical uncertainty and tightening financial market conditions. China posted a set of very disappointing trade data today. Exports and imports posted biggest contraction since 2016. More importantly, imports from the US dropped a massive -35.8% yoy in the month. But for the year, trade surplus with the US hit a record high. Trade surplus widened to USD 57.1B, above expectation of USD 51.6B. However, exports dropped -4.4% yoy to USD 221.3B. Imports dropped -7.6% yoy to USD 164.2B. Both imports and exports suffered the steepest decline since 2016. With the US, export dropped -3.5% yoy to USD 40.3B, imports dropped a massive -35.8% yoy to USD 10.4B. With EU, exports dropped -0.3% yoy to USD 37.6B, imports dropped -2.7% yoy to USD 22.5B. With Australia, exports dropped -5.2% yoy to USD 4.0B, imports dropped -3.4% yoy to USD 7.3B. With the US, exports rose 11.3% yoy to USD 478.3B, imports rose just 0.7% yoy to USD 155.1B. Trade surplus with the US jumped 17.2% yoy to USD 323.2B, highest on record. With EU, exports 9.8% yoy to USD 408.6B, imports rose 11.7% yoy to USD 273.4B. Trade surplus with EU rose 6.2% yoy to USD 135.1B. With Australia, exports rose 14.2% yoy to USD 47.3B, imports rose 11.2% to 105.45B. Trade deficit with Australia rose 8.9% yoy to USD 58.1B. Link to China customs department data, in simplified Chinese. China and the United States have conducted several rounds of consultations on economic and trade issues in an effort to resolve differences and achieve a win-win situation. We deeply regret that the United States has disregarded the consensus it has formed and is fickle, provoking a trade war. This move is not only damaging bilateral interests but also undermining the world trade order. China firmly opposes this. China does not want to fight a trade war. However, in the face of short-sighted behavior that the United States has done against people’s disadvantages, the Chinese side has to give a strong blow back, resolutely safeguard national interests and the interests of the people, and resolutely defend economic globalization and the multilateral trading system. We will immediately introduce taxation measures of the same scale and the same strength. All the economic and trade achievements previously reached by the two parties will be invalid at the same time. In today’s era, launching a trade war is not in the global interest. We call on all countries to take joint action, resolutely put an end to this outdated and regressive behavior, and firmly defend the common interests of mankind. The Hong Kong Monetary Authority (HKMA) has just intervened in the currency market as the HK dollar (HKD) hit the weak side (7.85) of the trading band against US dollar (USD), the first time since 2005. The de facto central bank of the city has bought HK$816M Hong Kong dollars from the currency market. The intervention would lower the aggregate balance to HK$178.96 billion on April 16, when the withdrawn funds will be settled. Interbank liquidity would stay ample after the withdrawal. We do not think this would help much, if any, in narrowing the spread between HIBOR and LIBOR, the key reason causing capital to flow out of Hong Kong and hence weakness of HKD. As such, we do not feel surprised to see HKD to hit the weak side of the trading band again and this might lead to further HKMA intervention. Trump also singled out Germany in his twitter attacks. The 58-page document contains no mention of exit from the Eurozone. But it called for a review of EU governance and fiscal rules. That indicates there could be less revenue and more debt for the governement in the near term. Italian 10 year yield jumps to high as 2.22 today, hitting the highest level since last July. The joint program will be put to vote by 5-Star and League members. After approval, it will be presented to Italian President Sergio Mattarella. Italy PMI services rose to 50.4 in February, up from 49.7 and beat expectation of 49.5. Markit noted that “activity rises slightly in February”, “new orders fall for first time since February 2015”, and there was “third consecutive fall in selling prices”. “With the Italian economy currently in a recession (its third in the past ten years), February’s Italian Services PMI data did not provide much sign of relief. “Inflows of new business contracted for the first time in four years, amid the third month of falling output charges, signalling that attempts by service providers to stimulate customer demand are not always proving effective. Australia NAB business confidence dropped to 3 in November, down from 5. Business conditions dropped to 11, down from 13. Alan Oster, NAB Group Chief Economist noted that “the downtrend in conditions has continued in November” and, “this trend suggests that the business sector has lost some momentum since late 2017 and early 2018.” He added “confidence is now below average, suggesting that businesses themselves think momentum will slow further”. On falling house prices, though, Oster noted “businesses do not yet suggest they are having a material impact.” And, “falling house prices in themselves may have a ‘wealth effect’ on households but given the prior large run up the impact of the declines to date is unclear”. Also from Australia, house price index dropped for the third quarter by -1.5% qoq in Q3, matched expectation. Over the year, house priced dropped -1.9% yoy. Among the capital cities, Sydney’s house prices dropped -1.9% qoq, -4.4% yoy. Melbourne’s dropped -2.6% qoq, -1.5% yoy. However, gains was recorded in Hobart (1.3% qoq, 13.0% yoy), Adelaide (0.6% qoq, 2.0% yoy) and Brisbane (0.6% qoq, 1.7% yoy). China’s central bank PBoC announced on Sunday to cut the reserve requirement ratio (RRR) for some lenders by 1%, effective October 15. According to the bank’s statement, this will release a total of CNY 1.2T. Of which, CNY 0.45T will be used to repay existing medium-term funding (MLF) facilities which will mature on the same date. The cut will apply to large commercial banks, joint-stock commercial banks, city commercial banks, non-county rural commercial banks and foreign banks. PBoC also maintained that despite the RRR cut, monetary policy is “stable and neutral” and the “orientation has not changed”. It added that the cut added liquidity but monetary policy is “not relaxed while market interest rate is stable. PBoC does not expect “depreciation pressure” on the Chines Yuan after the move. PBoC’s statement and Q&A in simplified Chinese. Overall, to us, the central bank’s RRR cut is clearly a pre-emptive counter measures to the market volatility last week. That is, the steep decline in Asian equities as well as surge in global treasury yields, which China was on holiday for a whole week. It’s measures to stabilize the Chinese market when it’s back from holiday tomorrow. We’ll have too see the reactions in the Shanghai SSE and USD/CNH tomorrow to see how the cut is received by the markets. Meanwhile, we will cancel the AUD/USD short strategy as noted in weekly report, and see how the markets react first. Here is an update on our position trading strategy last updated in the weekly report. To recap, we maintained our bearish view on Aussie, but we’re not convinced regarding Yen’s strength. 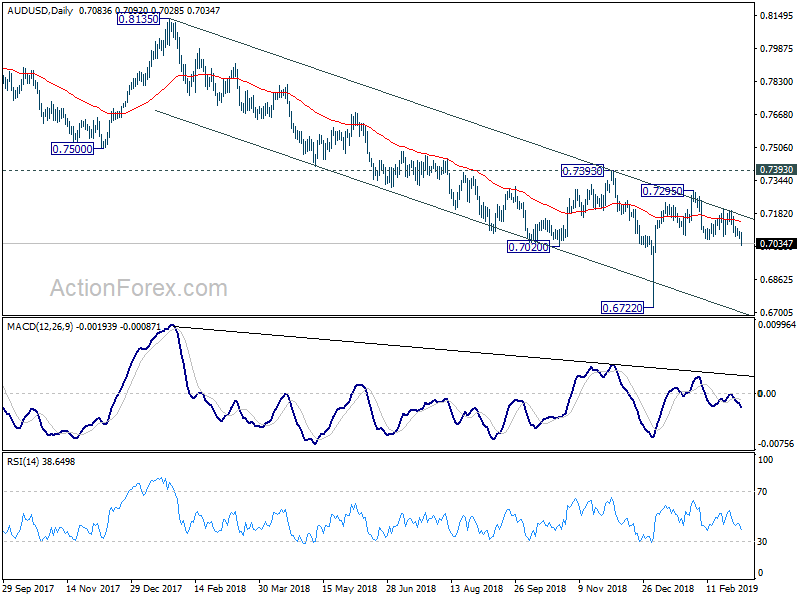 Therefore, we decided to switch from AUD/JPY short to AUD/USD this week. 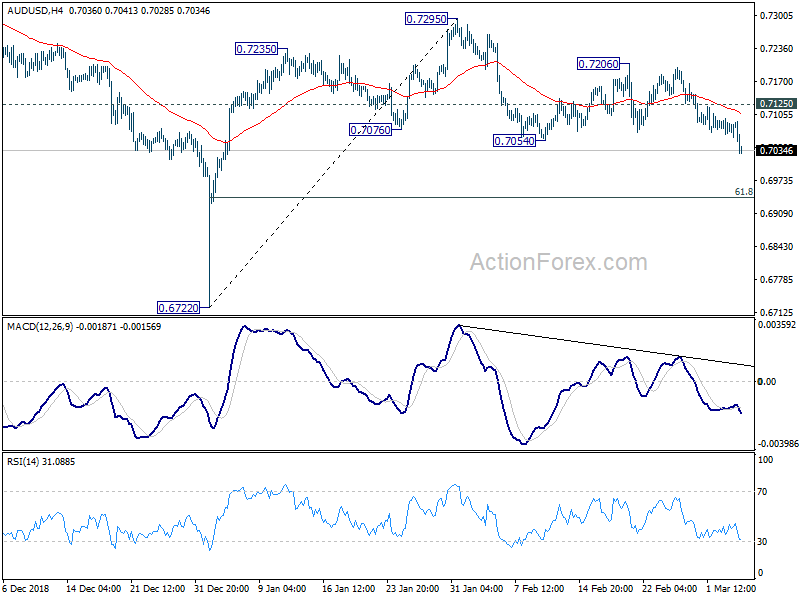 The AUD/JPY short (entered at 78.40) was closed at 79.50 at weekly open, with 110 pips loss. AUD/USD’s is entered today on break of 0.7050. 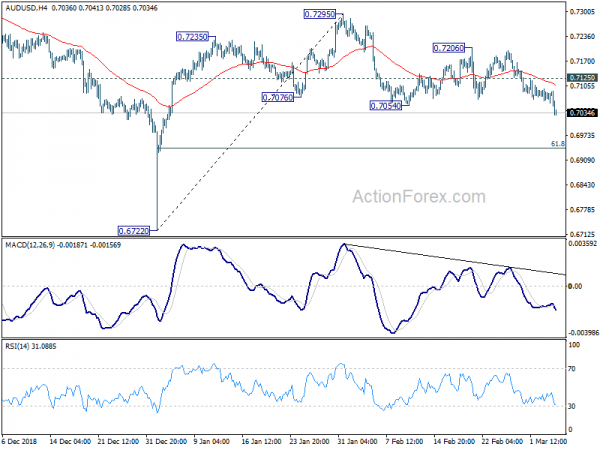 Today’s break of 0.7054 support should confirm completion of rebound from 0.6722 at 0.7295. 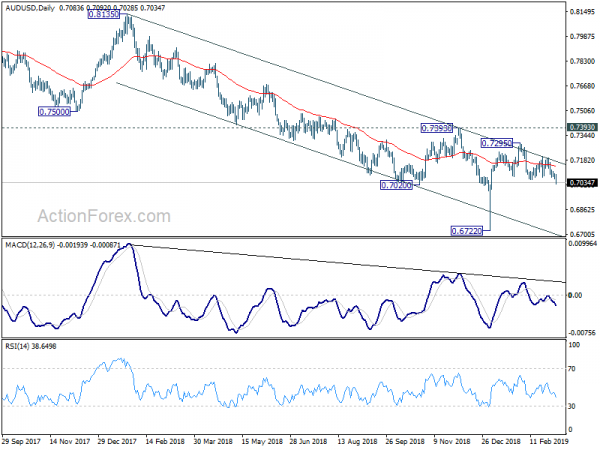 AUD/USD is staying inside medium term falling channel and failed to sustain above falling 55 day EMA. Both affirmed our bearish view. Further decline should be seen back to retest 0.6722 low in near term. In the larger picture, the corrective rise from 0.6826 (2016 low) completed at 0.8135 after rejection by 55 month EMA. The dive to 0.6722 was a result of the currency flash crash earlier this year. 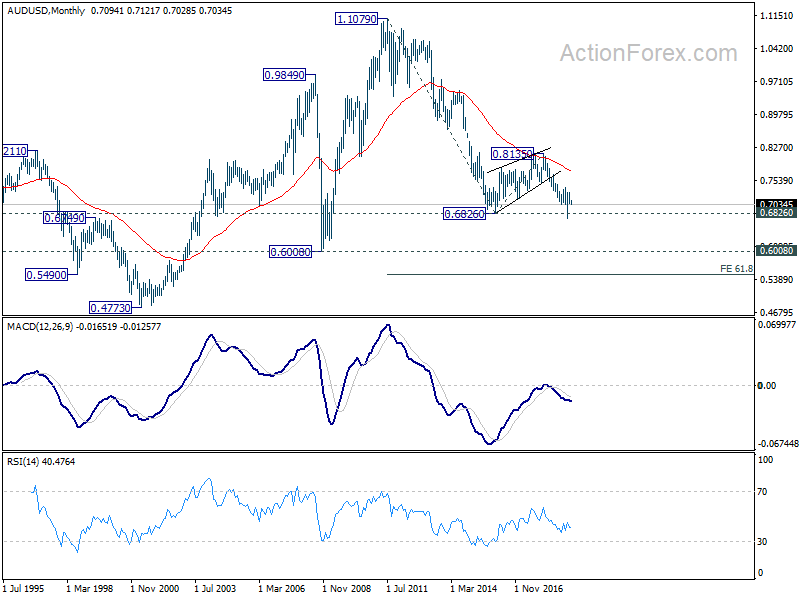 Thus, AUD/USD couldn’t sustain below 0.6826 low at that time. But we’d anticipate a firm break of 0.6722/6826 zone with the current fall to resume the long term down trend from 1.1079 to 0.6008 and below. 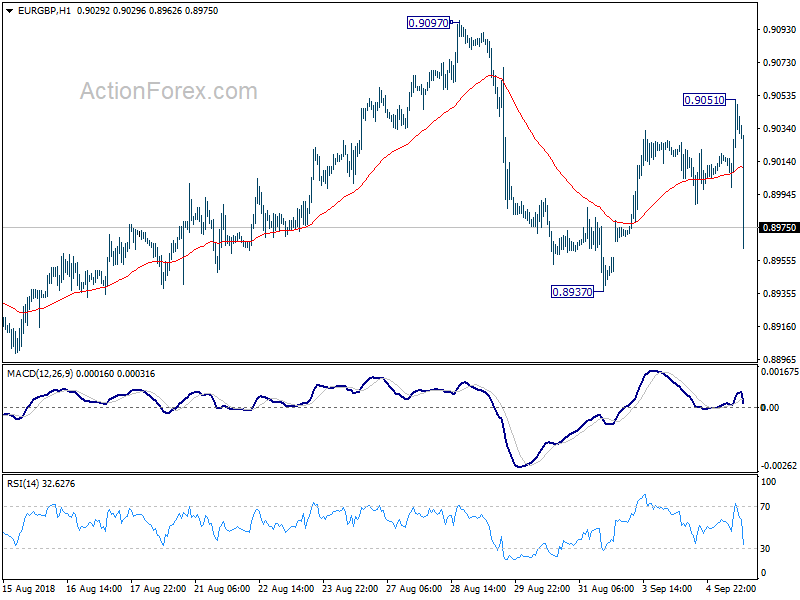 To conclude, we’ll hold short in AUD/USD, with stop at 0.7125 first to give it some breathing room. 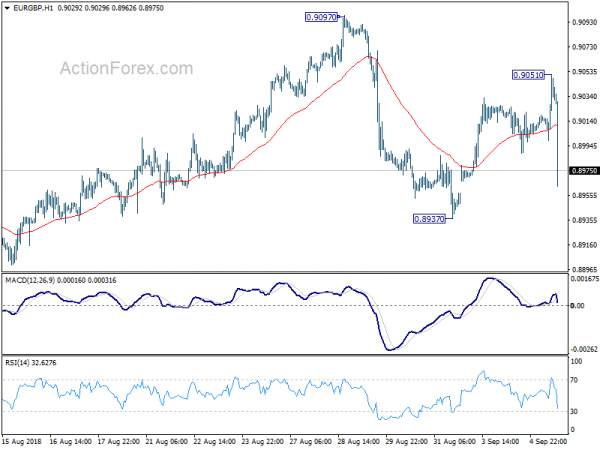 0.6722 is the first target and we’ll assess the reaction from this level to decide whether to exit. But we’re tentatively looking at 0.6008 as the point to close the trade. BoE will most likely keep the Bank Rate unchanged at 0.50% tomorrow. Known hawks Ian McCafferty and Michael Saunders are expected to vote for rate hike while others would vote for standing pat. There will be no inflation report but just the meeting minutes. And attention will on whether the minutes give any hint on an August hike. According to the latest Bloomberg survey, only 55% of respondents forecast a hike in August. That’s even down from 60% in a similar survey in May. The economists projected UK economy to growth 1.4% in 2018, better than May projection of 1.3%, after some positive economic data. Inflation forecast was unchanged at 2.5% yoy in 2018 and 2.1% yoy in 2019. One side note to mention is that McCafferty will end his term on August 31. He will be replaced by Jonathan Haskel, an professor of economics at Imperial College Business School. At this point, it’s unsure how the replace with reshape the MPC. From Canada, employment market grew 11.2k in October, below expectation of 25.0k. Unemployment rate dropped to 5.8%, below expectation of 5.9%. Trade deficit narrowed to CAD -0.4B but missed expectation of CAD 0.2B surplus. Latest trade data from China showed that total trade between US and China shrank -15.4% in Q1, comparing with last year, as result of trade war. In particular, imports from US dropped a massive -31.8% yoy in the quarter. On the other hand, imports from Canada jumped 25.9% yoy and imports from Brazil surged 23.8% yoy. Overall trade growth with EU remained healthy. China trade surplus widened to USD 32.6B in March, well above expectation of USD 8.1B. Exports jumped 14.2% yoy in USD 198.7B, well above expectation of 7.7% yoy. Imports, however, dropped -7.6% yoy to USD 166.0B, much weaker than expectation of -0.1% yoy. Cumulative from January to March, expects rose 1.4% yoy to USD 551.8B. Imports dropped -4.8% yoy USD 475.4B. Trade surplus was at USD 76.3B. Exports to EU rose 8.8% yoy to USD 97.8B. Imports from EU rose 1.8% yoy to USD 64.8B. Trade surplus was at USD 33.0B. Total trade dropped -15.4% to USD 119.6B. Exports to US dropped -8.5% to USD 91.1B. Imports from USD dropped -31.8% to USD 28.5B. Total trade rose 5.7% to USD 37.9B. Exports to AU rose 9.7% to USD 11.0B. Imports from AU rose 4.1% to USD 26.9B. Trade deficit was at USD 15.9. Full set of data by country here. Kansas City Fed President Esther George said in a speech that weakness in Q1 growth could reflect “transitory factors” such as the government shutdown, financial volatility, an unusually harsh winter, and heightened policy uncertainty. But over the medium term, the “generally positive outlook” of the US economy has “several prominent downside risks”. The biggest risks come from slower growth abroad, “particularly in China, the euro area, and the United Kingdom.” Together with waning fiscal and monetary stimulus, they “represent a stronger headwind” then George’s baseline forecast. Right now, she noted that “data are noisy” and more time and evidence are needed to “separate the signal from the noise”. Dollar receives some solid buying as the rally in 10 year yield picks up steam to above 2.9 handle. That’s a wake up call to traders that TNX could now be taking on 2.943 high, which is a key near term resistance. Break of which will finally resume the larger up trend, through 3.0 handle, 20 2013 high and 3.036. The correlation of Dollar and yield has somewhat broken down in recent months. But a break above 3% could be the turning point to realign the correlation. In an interview with the WSJ, Trump said it was “highly unlikely” for him to hold off on raising tariffs on USD 200B in Chinese goods from 10% to 25% on January. We went further to threaten China for more tariffs if they cannot make a deal. Then Trump warned “If we don’t make a deal, then I’m going to put the $267 billion additional on”. Sterling rebounds strongly as Bloomberg reports that both Germany and UK have dropped key Brexit demands, citing unnamed source. Additionally, there are signs of progress on the key sticky issue of Irish border. In short, Germany is said to accept a less detailed agreement regarding the future relationship. Meanwhile, UK is also prepared to accept a more vague statement of intent on the relationship too. Most importantly, EU’s chief Brexit negotiator Michel Barnier has openly said he strong opposed to the Chequer’s plan. That’s the trigger for Sterling’s selloff this week. But Bloomberg’s source said that such opposition isn’t necessarily an obstacle for the agreement. That could finally ease the path to a Brexit deal to be concluded in October, or may be later in November.